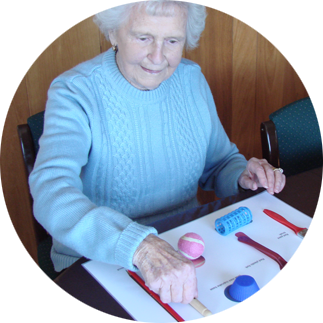 Montessori is about changing how aged care is delivered. It requires a re-writing of the book on how to deliver care: this is a model that focuses on strengths and ability, quite the opposite of the current focus on disability. In an industry where dollars and staff numbers are limited, Montessori provides a fresh approach where resident strengths can support staff duties and enable residents to maintain (even - in some cases - regain) independence whilst boosting self-esteem, and feelings of self worth. In most care communities, staff spend a lot of time doing tasks that could be done by residents. If residents can participate in their community by doing the tasks that they have the skills to do, then staff are free to focus on other tasks while residents have a reason to get out of bed every day. If residents maintain their ability to feed themselves for much longer than we might expect by the use of Montessori fine motor skill activities, we have enabled them to maintain their independence and dignity as well as avoided another task for staff to complete in an already busy day.